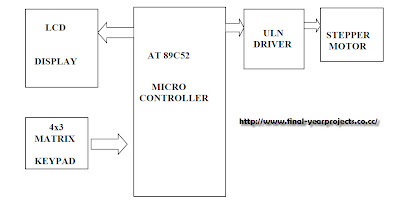 This is a good project report on Microcontroller based Advance Military Security Lock system. The aim of this project is to provide the security. Now a day’s security system is must for every organization. Access control system is one system that is used for security purpose in many organizations. 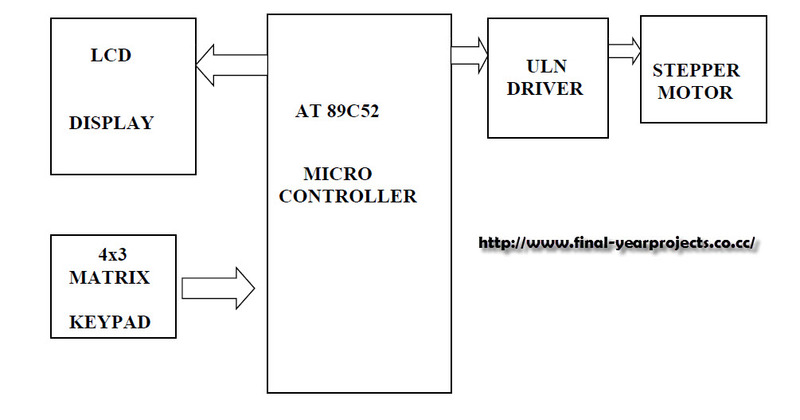 This project uses component like 89C52 Microcontroller, ULN 2003 Driver IC, Stepper Motor, LCD Display, Key Pad. You can also Subscribe to FINAL YEAR PROJECT'S by Email for more such Projects and Seminar. Above image shows the block diagram of Advance Military Security Lock. This system has intelligent of allowing only valid passwords. This is 89C52 microcontroller based project which is interfaced to keypad, LCD- display and Stepper motor. We used a 4x3 matrix keypad to have an access to system. Use it for your reference and study. Report also include Circuit diagram of the project.